No trip to Spain would be complete without sample its famous rice dish, paella. The ingredients alter from region to region, but this recipe uses salmon fillet and mushrooms. 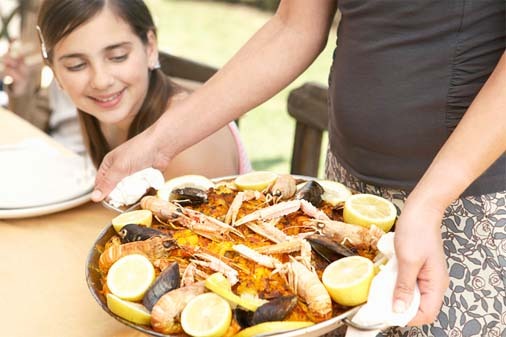 Serve this seafood paella with crusty whole-wheat bread. Put the rice and stock together in a large saucepan and bring to the boil. Sprinkle in saffron and simmer until rice is cooked. Drain. Fry the salmon in the oil until lightly browned, add the prawns and cook a few more minutes. Remove the seafood, then slice the salmon. Fry the onion, mushroom, garlic and courgette until lightly browned. Add the water. When it sizzles, add remaining vegetables. Stir-fry for 10 minutes, then fold in the rice and seafood and serve. I’m an acupuncturist myself and practice TCM(traditional Chinese medicine) too. Before I started studying TCM I never cared what types of food I eat but now I choose it carefully. It is amazing how properties of food (hot, cold, pungent, sweet etc.) affect your body. Definitely it is a good idea to take the TCM’s approach into what you eat every day. Thank you for making an article about it. I hope a lot of people get interested in it through your article!